A guy who was much cleverer than me once said, “Put not your trust in money, but put your money in trust”. He might as well have been talking about unit trusts. Company shares, or stocks and government securities are good investment opportunities. The trouble is, in order to take advantage of the opportunity, one needs a significant amount of money to attract a licensed investment advisor or uncommon investment skills to invest successfully. 1) The unit trust funds companies are professionally managed and the funds managed by qualified investment professionals. Such professionals are better placed to make profitable investment decisions than most individuals. Furthermore, they are licensed and regulated by the Capital Markets Authority. Your money could hardly be safer. 2) There is a variety of funds available, with varying levels of risk and return. There are money market funds with minimal risk, equity funds that offer much higher long terms returns but with higher risk and balanced funds that are between the two extremes. This is a really good thing because it means that you can choose funds that meet your exact needs. 3) Diversification is one of the basic tenets of investment – do not put all your eggs in one basket. With a unit trust fund, your investment is immediately diversified because each fund consists of investment in tens of different stocks. 4) You can automate your investment by putting a monthly bank standing order. This is the best way to ensure regular investing. The worst is to hope to invest whenever you have extra money, you probably never will. 5) Compound growth is the secret sauce for fast growth of your wealth. With unit trusts, you get to take advantage of compound growth because dividends and interest are automatically reinvested. 6) Have you ever experienced the frustration of needing money but being unable to access your own account or get an immediate buyer for an asset? Well, the unit trust is liquid and you have easy access to you money should you wish to have it. You usually get your funds within seven days of making a withdrawal request. With all these advantages, I would congratulate you on your wisdom if you asked where the catch is. Unit trusts publish their investment objectives and you should ensure that the one you select matches you investment goal. Actually unit trusts are a noble idea, but one which is sometimes perverted in to a profit sucking leech. Some companies offer packaged investment products that ride on the name of unit trust but are really just an investment contract that happens to invest in unit trusts. The investor’s problem is that there is a layer of charges that significantly reduces the portion of the investor’s funds that are actually invested and therefore significantly reduces the returns. With these other products or contracts, the devil is in the fees. If you want a unit trust, invest in one directly. 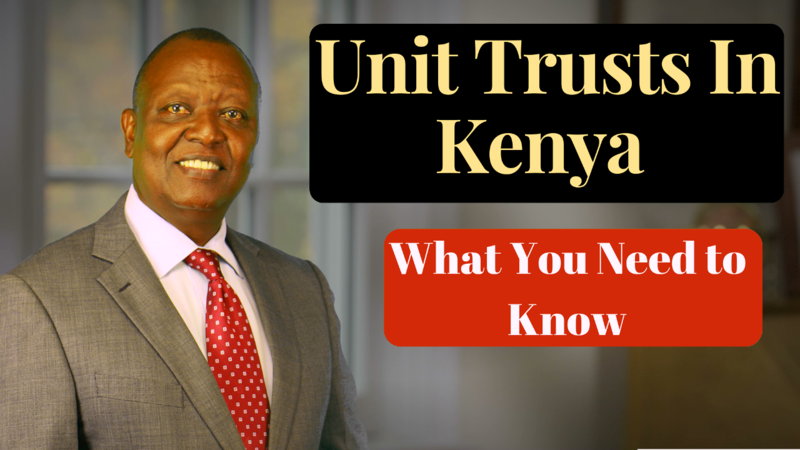 I hope this helps you see how to you can take advantage of unit trusts and invest in Kenya. Please leave your comments and questions below. Thank you for your time and if you found this helpful, please share with your friends. God bless you!